Because we have so much amazing stuff this week, friends, I'm hesitating even say that this Nokomis dress is our special treat (that would be Alexandre McQueen, but let's not get ahead of ourselves! ), but, obviously it is the top one in my heart! 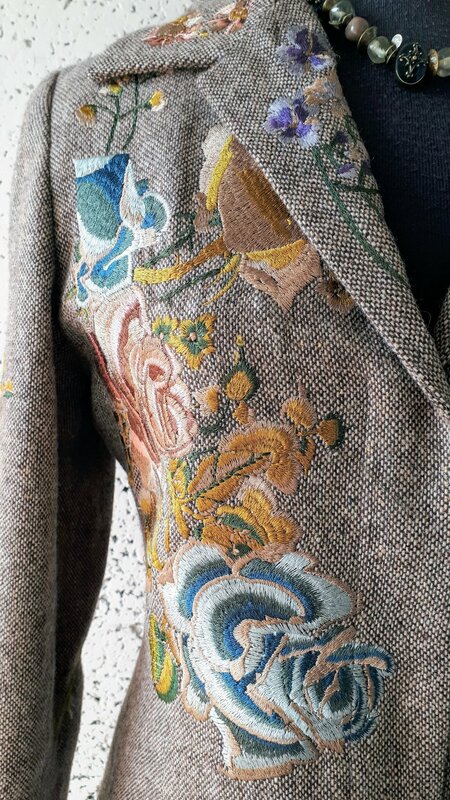 I think the hidden button band on this coat keeps it from looking too vintage-y, but the star of the show is all that awesome embroidery! There is more embroidery on the back (birds! 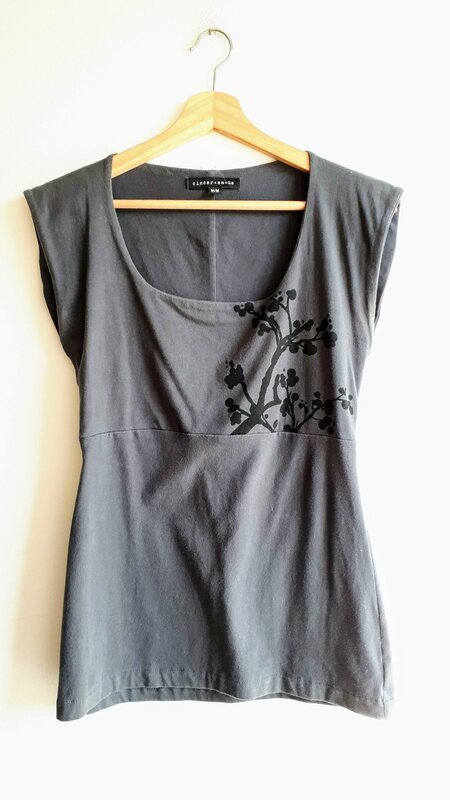 ), and I what I really love is the embroidered vines running down the arm! Oak+Fort just Oak+Forting with this lovely, simple slate grey tunic from one of our indie-faves! Friends, I have been trying to pay more attention to our men's section these days. 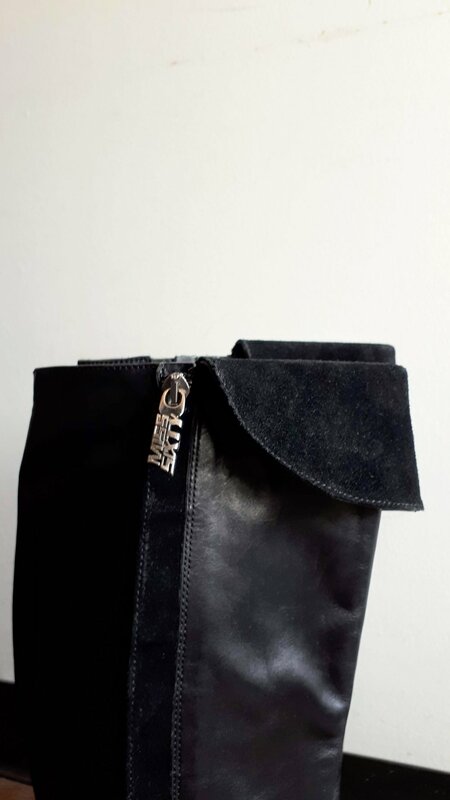 There is some AMAZING stuff in there, and immatellyou that I have scored several cool pieces from the mens section for myself! I just peeked around the corner and grabbed the first thing that caught my eye....and it just happened to be an Alexander McQueen coat! I love grey and yellow together (I don't want to give away too much, but grey and yellow are part of the colour pallet of our new shop! ), and I love how they pair together in subtle striping on the coat, and then are boldly high-lighted on the collar and cuffs! A whole crop of tall boots have suddenly sprouted in the shop! 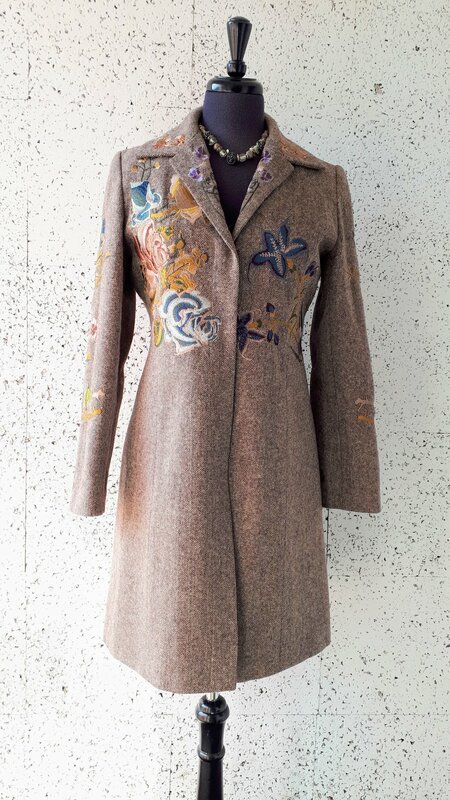 How charming is this wool coat?! There is something just downright adorable about this one, but I'm not sure I can put my finger on why that is. The beige and black really pop and highlight the shape of the jacket, and although it is double breasted, this one reads more "playful" to me than the military look I sometimes find in these trypes of coats. Gah! I forgot to check the brand on these for you (damn my humanity! ), but they are so fierce that I still have to share them with you! To me these have the perfect heel shape and height, but obvs the calf-hair ankle collar is the show stopper! 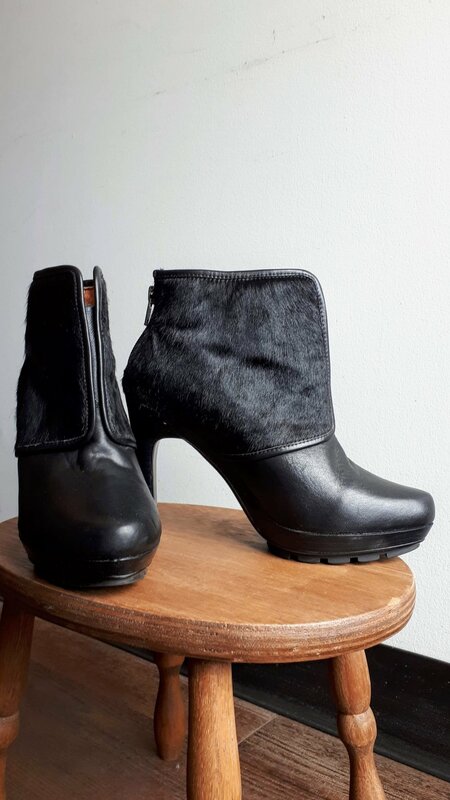 The ankle is fitted, not a stovepipe top or slouchy drape like we are used to seeing on booties like these, and I think this is what makes them unique and feminine. How sleek and elegant is this jacket?! Our Laura was in the shop when I popped in (friends, it was her last day on Saturday! She's going back to school and leeeeeeeeaving uuuuuuuuussss! ), and we talked about our inner battle when it comes to mixing silver and gold, and how this mixed-metal rope-chain necklace gave us permission to go ahead and cross that line! And a classic from one of our local faves Cinder and Smoke! I also happened to be in the shop while Colleen was doing a bunch of intake, and check out all the cool things she was taking in! Seychelles and something with a bike print! Can't wait to see what you are, Preloved! Our Laura has been with us for over 3 years, friends. She taught me how to use Instagram and how to identify the back side of a purse while using the term "This signals to me..." which I use in all my sentences now, and she help me pick out my glasses at the Observatory! She has a great sense of fashion and connected so well with the shop. We miss you already, Laura! And over on Whyte ave and 99 street, the new Pony is a mess. As often happens in renos, the removal of one broken tile lead to the unplanned removal of ALL THE TILES. As far as bad surprises go, that one is not so bad. As I type (that's about 10 minutes before you read this! ), the fitting room and other walls are being built by Pat, who framed the Garneau Pony so square that other trades people would actually ask us who did the amazing framing! I feel like we haven't chatted for so long, friends! I will be in the shop tomorrow (Thursday) and then all weekend. 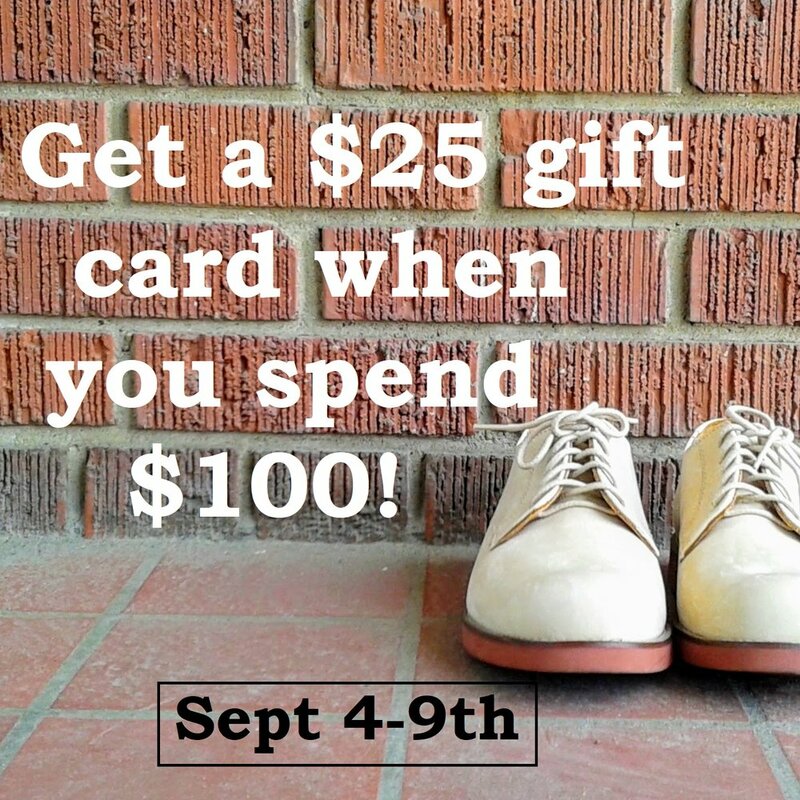 We are having our awesome "Spend $100 and get a $25 GC" sale this week, so it's a great time to come down for a visit!